NETWORK FINALS: The GRAMMYS gained half a point in final numbers, but 5.9 is still an all-time low in the demo. Elsewhere, the 10PM SHARK TANK lost 0.1. CABLE HIGHLIGHTS: Sports on ESPN topped Sunday cable, with the PRO BOWL at 1.00 (down a huge 1.56 from 2017) and an NBA game at 0.81, with X GAMES coverage at 0.42. Bravo’s REAL HOUSEWIVES OF ATLANTA fell 0.11 to 0.78, and TO ROME FOR LOVE was down 0.09 to 0.24. On Food Network, WORST COOKS IN AMERICA jumped 0.16 to 0.54, and GUY’S GROCERY GAMES was up 0.13 to 0.40. E!’s GRAMMY AWARDS RED-CARPET special was at 0.52. ID’s EVIL LIVES HERE took a 0.14 leap to 0.46, and ON THE CASE ticked up to 0.36. HGTV’s line-up was led by BEACHFRONT BARGAIN HUNTERS at 0.45/0.42, up from last week’s 0.26/0.23. 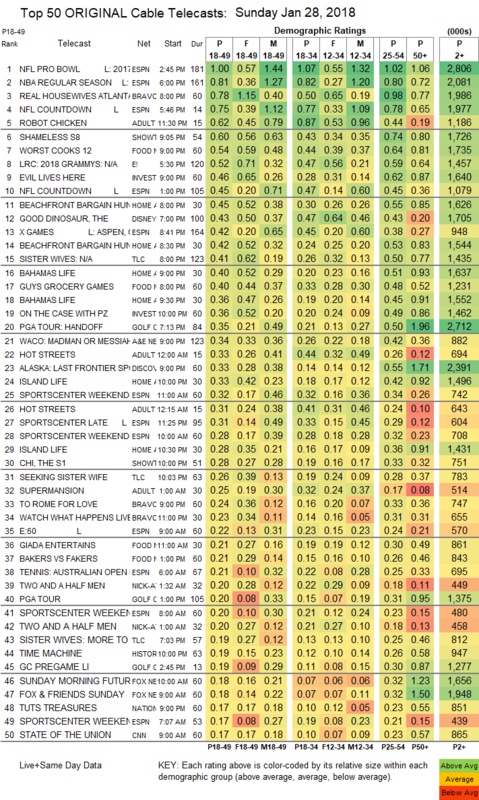 On TLC, SISTER WIVES was steady at 0.41, and SEEKING SISTER WIFE was also steady at 0.26. A&E’s WACO: MADMAN OR MESSIAH was at 0.34. Discovery’s ALASKA: THE LAST FRONTIER dipped 0.03 to 0.33. 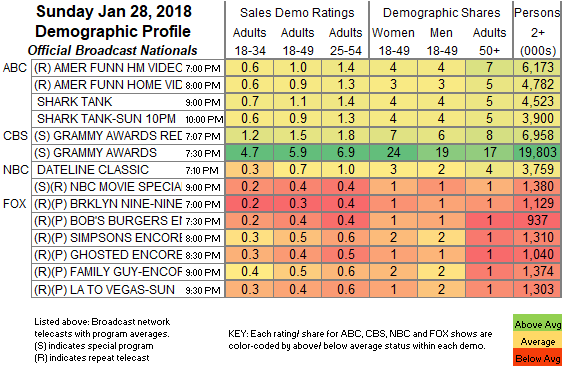 Adult Swim’s ROBOT CHICKEN led scripted, steady at 0.62, with HOT STREETS at 0.33/0.31, compared to last week’s 0.43/0.35, and SUPERMANSION was up a tick to 0.25. The season finale of Showtime’s SHAMELESS rose 0.06 to 0.60, and the newly-renewed THE CHI was up 0.04 to 0.28. On HBO, CRASHING dropped 0.03 to 0.12, and DIVORCE was down 0.05 to 0.11. Starz’s COUNTERPART gained 0.02 to 0.11.